"Vitamins are essential nutrients that allow our bodies to function in an optimal way. That becomes the crux of the controversy. How much is enough - how much is too much?" Monday morning drive time. I love it. It's uninterrupted time to feed my brain with NPR's Morning Edition or podcasts, and this Monday I hit the mother lode. WCPN's Sound of Ideas had an hour long program on vitamins and nutrition with two of my favorites, Joe Graedon of The People's Pharmacy, Nancy Clark, a sports nutritionist, and Dr. Susan Joy, a specialist in Sports Medicine at the Cleveland Clinic. A pharmacologist, a nutritionist and a doctor walk into a radio studio, and they all have a different point of view! Of course I arrived at work a half hour before the show ended. No problem. WCPN streams all their programs and I got to hear the whole broadcast yesterday. You can hear it too, by clicking here. Only problem is, these three experts had so much great information to share that I ended up with 6 pages of notes. Today's post will just be Joe Graedon's gems. He's the well-known pharmacologist who teaches at the University of North Carolina at Chapel Hill, writes the syndicated column and website, The People's Pharmacy, and has authored many books. I like Joe because first and foremost he's a scientist and skeptic. He scrupulously follows the medical literature, yet he has a huge following so he gets actual feedback from a tremendous number of people about what works and what doesn't. Like everything in the area of nutrition, exercise & health, most of this you've probably heard before, but if you're like me, it helps to hear what the experts do when it comes to their own health. Vitamin D. The need to take it is incontestable. Study after study shows it makes strong bones, reduces common cancers, has anti-inflammatory properties which improve arthritis, prevents type-2 diabetes, and reduces depression. Most of us are deficient, especially those of us living in gray Northern climates. It's actually a hormone that is produced when the skin is exposed (without sunscreen) to sunshine. For adequate doses you need to be in the sun for 15-20 minutes, 3-4 times a week. Joe recommends 1000-2000 IUs a day of D3. Outside of sunshine & supplements it's only available in oily fish or fortified milk, and 1 glass of milk usually provides only about 200 IUs. I plan to get my levels retested in a couple of weeks, now that I've upped my intake of Vitamin D3. For my earlier post on Vitamin D, click here. Fish oil. This is Joe's favorite, and mine too! He likes fish oil for its anti-inflammatory properties, which doesn't usually get a lot of press. Most people just don't eat enough fish to get the adequate anti-inflammatory benefits. Here's how it works. Fish oil can significantly diminish the production and effectiveness of various prostaglandins which are naturally occurring hormone-like substances that accentuate inflammation. That's a good thing! Joe says most athletes rely too much on "Vitamin I" or ibuprofen for aches, pains & injuries, which can raise blood pressure and are hard on the stomach. He adds (and pay attention to this one!) that Joe Maroon, the team neurosurgeon for the Pittsburgh Steelers advocates against ibuprofen for aches & pains, and advises his team members to get an adequate intake of fish oil. Not only does it reduce pain and inflammation, but it lowers triglycerides, which are often elevated in football players who eat diets high in refined sugar and carbs. Vitamins/Minerals your body lacks if you're on medication. Even if you eat a healthy diet, if you're on certain meds, you might be deficient in specific vitamins & minerals. If you're taking a diuretic for high blood pressure, you're going to need more magnesium. If you're taking a prescription or over-the-counter stomach acid suppressant like Nexium or Prilosec, for heartburn or acid reflux, you're going to have a hard time absorbing Vitamin B12. Your diet alone will not provide you with enough B12! If you're on a statin like Lipitor or Pravachol to lower your cholesterol, you're going to be deficient in Co-Enzyme Q10. Statins prevent the body from making Co-Q10, which is an essential nutrient for the body, almost like a vitamin. The joint pain and muscle aches some people experience when taking statins, particularly at higher doses, is because of diminished Co-Q10. He recommends 100-200 mg or more of Co-Q10 for anyone taking a statin, depending upon how high a statin dose you are taking. Consult your doctor regarding any of these! Best supplements & home remedies for joint pain & joint health. Lots of repetition here, but worthy of mentioning again. When it comes to joint pain, Joe's a big fan of Co-Q10 (if you're on a statin), fish oil, Vitamin D, and magnesium. He also recommends 2 weird natural cures that have helped many, and won't cause harm. A box of golden raisins soaked in gin and taken in a dose of 9 raisins a day is something he says many swear by. Also, Certo, which is a plant pectin used for making jams & jellies mixed with grape juice seems to help many others. There are many "recipes" for this, but one variation is mixing 1 TBS of Certo with 8 oz. of grape juice. Click here for more info. As for glucosamine chondroitin, Joe won't come right out & say it's worthless, but the data hasn't supported the benefits to the degree that its enthusiasts do. His advice: if it works for you great, keep taking it, but it's not his top pick. Top food recommendations: Eating 5+ servings of fruits and veggies a day is the best free-radical quencher you can take. Free radicals are the highly reactive molecules in our body that can damage healthy cells. He's a huge fan of anything with a lot of color, especially in the carotenoid family, like tomatoes, squash, red bell peppers, kale, mustard and beet greens, and broccoli. He advises eating fish, especially salmon at least 2 times a week, drinking red wine or pomegranate juice and eating lots of broccoli. Boy, I wish I liked that veg. I must have the TAS2R gene. Breakfast tips. Make sure you're not eating a breakfast of just carbs, like cereal & fruit. It will raise your blood sugar and insulin levels. Not a good thing. He encourages us to include protein with any carbs we eat for breakfast, and to make sure the carbs are whole grain to slow their absorption & keep our blood sugar steady. He often eats cottage cheese & fruit for his breakfast. Magnesium. Another fave, because it lowers blood pressure, lowers LDLs (the bad cholesterol component), improves the LDL/HDL ratio, prevents the oxidation of LDL, promotes arterial function, has anti-inflammatory properties, relieves muscle cramps and prevents migraine headaches for some. This is a mineral that most of us are deficient in. It's my number 2 personal favorite! Check the reliability of any supplements you choose to take. 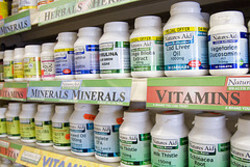 Check the Consumer Labs website to find out the reliability and safety of the vitamins and supplements you are taking. They've done a lot of analysis on supplements and you'll be able to find out which brands are better than others. The good news is that most of them are just fine. For the link to Consumer Labs, click here. Beware of celebrity endorsements & be aware of generic drugs. Beware of celebrities endorsing any drugs,vitamins or supplements, especially if it's a paid advertisement. Remember Dr. Jarvik's Lipitor endorsement? It's no longer published. As for the generics, Joe receives reports from people around the country who experience problems when they switch to a generic drug, from a brand name that had worked well for them in the past. Note that this is only for a few generics. He has some concerns about the equivalences of some generic drugs. From his experience he thinks the FDA is too short-handed, and can't be relied upon 100% in monitoring & testing the generics. Just take it as a warning if your generic isn't working the same as a brand name product. This post represents the opinions of Joe Graedon. None of these vitamins or supplements should be taken without advice from your own doctor. Many can interact with medications, causing dangerous side effects. For instance, no one with heart failure or chronic recurrent angina should ever take fish oil without a doctor's advice and supervision. Buyer beware, and error on the side of caution. Food is always the safest "medicine". Stay tuned for Tips from Nancy Clark & Dr. Susan Joy later in the week! Thanks for all the wonderful advice about vitamins, minerals and other nutriments! I try to get all I need from my natural, organic diet, rather than taking tablets, though. Great info! As a physical therapist that follows the research this is all great advice. Other Ingredients: Rice Bran Oil, Gelatin, Glycerin, Soy Lecithin, Titanium Dioxide Color. If you want to remove the automatic links you can put the nofollow tag in next to them -- that keeps people from getting Google credit for being mentioned, if you decide their website/product isn't one you want to contribute to supporting. Browsing today I discovered that yes, Vitamin D is available in other than the little gelatine capsules filled with soy oil that I'd been taking. Oh good, more stuff to throw out and replace. Thanks for the comment Hank--that came in way back before I started moderating comments. I don't publish anything that's really advertising.